In the latest move to celebrate the 70th anniversary of diplomatic relations with North Korea, China on Monday opened a new road port in Ji'an, Northeast China's Jilin Province. In September 2011, North Korea fully funded a road bridge connecting Ji'an and Manpo, said the statement. It is estimated that ports in Dandong handle around 60 percent of the total bilateral trade between China and North Korea. The two countries have 15 border ports. However, as Pyongyang is still under international sanctions, trade in mineral resources and products such as coal will be limited, Lü told the Global Times on Tuesday. With a borderline of 203 kilometers, Ji'an aims to build a border economic cooperation zone with an estimated investment of 8 billion yuan, the city's government website shows. The international road freight transport facility will be open all year round, with cargo exports and imports from Monday to Friday, while people can cross seven days a week, Jilin government said. The opening of the facility also comes amid North Korea's high-profile actions to boost its economy and improve people's lives. During the past week, North Korean leader Kim Jong-unmade four inspection visits to economic projects and facilities, a move seen by analysts as a demonstration of Pyongyang's determination to focus on the economy and people's livelihood ahead of its upcoming parliament meeting. According to North Korea's official Korean Central News Agency, from Thursday to Monday, Kim inspected a construction site and a potato factory in Samjiyon County, a department store in Pyongyang, a hot-springs tourist area in Yangdok County and the Wonsan-Kalma coastal tourist area. China's trade with North Korea reached 16.09 billion yuan ($2.38 billion) in 2018, down by 52.4 percent year-on-year, Li Kuiwen, spokesperson for China's General Administration of Customs, disclosed at a press conference in January. Chinese observers hailed these economic advances on border port construction as proof of China's constant and full support for North Korea's economic rebuilding and development. 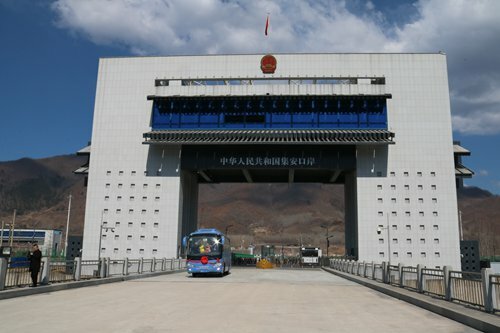 Lü said the new border facility is preparation for all-round economic and trade cooperation between the two countries once the sanctions are relaxed and fully lifted, and it is "a manifestation of China's confidence in a nuclear-free, peaceful and prosperous Korean Peninsula." The construction of the bridge was finished in 2016, but its opening was delayed by UN Security Council sanctions imposed on North Korea, Bloomberg reported Monday.